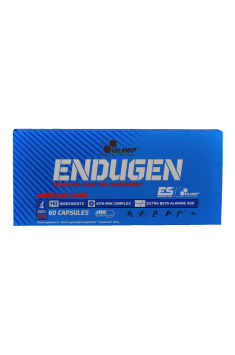 Olimp Endugen offers a combination of two blends, ENDUGEN™ MAX Effort Formula and Vita-MIN ENDUGEN™ Matrix, improving the body’s performance and endurance. Synergictic ingredients contribute to reducing fatigue and maintaining adequate energy levels and prevent lactic acid build-up in the muscles. The supplement contains also B vitamins, involved in energy metabolism and absorption of magnesium and sodium which have a key role in maintaining normal neurotransmission. Beta-alanine – a dipeptide which boosts carnosine levels in skeletal muscles. Carnosine functions as an acceptor of hydrogen ions which in excess cause fatigue and burning sensation in muscles. By regulating intracellular pH levels, beta-alanine helps increase the duration of exercise and training intensity. Sodium bicarbonate – also known as an alkali salt, has the ability to neutralise acids formed by metabolism. This helps enhance the activity of enzymes responsible for energy production, thereby increasing the body’s exercise capacity. Potassium ortophosphate – a chemical compound with antioxidant properties, used in the food industry as a stabilising and anti-caking agent. By acting in synergy with other ingredients, it helps eliminate waste metabolic products and regulate cellular pH levels, thereby delaying the onset of fatigue during a strenuous workout. L-Arginine alpha-ketoglutarate – this compound enhances the bioavailability of L-arginine which effectively boosts nitric oxide (NO) levels. NO causes the relaxation of the vascular smooth muscle, improving the delivery of blood, oxygen and nutrients to muscles. As a consequence, this enhances the body’s performance, reduces energy expediture of exercise and speeds up post-workout recovery. Taurine – a non-proteinogenic amino acid which is abundant in skeletal muscles and helps maintain water-electrolyte balance. Taurine improves skeletal muscle contractility and, as an antioxidant, aids in removing waste products from the body. What is more, it improves the delivery of creatine to muscles, consequently enhancing energy production. By acting on the nervous system, it helps maintain focus and speeds up reaction time. Korean ginseng extract – promotes well-being and increases energy levels during a workout. Since it has synergistic effects with arginine, it boosts blood flow around the body which, combined with reduced fatigue, allows you to extend the duration of exercise. What is more, it repairs training-induced muscle damage and therefore speeds up recovery. Guarana extract – contains 50% caffeine with slightly slower release than in coffee, giving you a long-lasting energy boost and reducing fatigue. It allows you to stay motivated and focused and accelerates metabolism and thermogenesis, consequently promoting weight loss. It supports a healthy vascular endothelium which is critical to nitric oxide production. Caffeine – the most popular ergogenic substance which blocks adenosine receptors and thus reduces fatigue. By inhibiting the breakdown of cyclic adenosine monophosphate (cAMP), it helps maintain high energy levels, which make it easier to complete long training sessions. Caffeine supplementation effectively enhances the body’s performance, speeds up the metabolic rate and increases focus levels and muscle power output. Cayenne pepper extract – comprises 8% capsaicin which boosts heat production in the body by binding the TRPV1 receptor. This speeds up the resting metabolic rate, consequently allowing you to create a calorie deficit and reduce body weight. Capsaicin intake significantly increases the body’s ability to oxidise fatty acids and prevents their accumulation in adipose tissue. Magnesium (as the amino acid chelate Albion®) – an element that is necessary for the synthesis of high-energy compounds in the body and hence the production of energy. Its supplementation reduces fatigue and improves the body’s performance. Magnesium is also involved in the transmission of impulses in the nervous system, which is critical to maintaining motor coordination and mental and physical health. Riboflavin (otherwise known as vitamin B2) – essential to normal functioning of mitochondria, responsible for the conversion of nutrients into energy. Since it helps synthesise neurotransmitters, it maintains normal mood and strengthens motivation. Adequate intake of this vitamin also boosts the production of red blood cells, responsible for the transport of oxygen in the body. Niacin (vitamin B3) – participates in energy production because it is a substrate for the synthesis of nicotinamide adenine dinucleotide (NADH). NADH, functioning as an acceptor of electrons and protons, is involved in cellular respiration and synthesis of high-energy compounds. Owing to that, this vitamin may stimulate fatty acid oxidation from adipocytes and help improve your body composition. Vitamin B6 – takes part in protein, fat and carbohydrate metabolism and is thus responsible for energy production from food. In addition, it is required for hormone and neurotransmitter synthesis and may increase post-workout release of growth hormone. Vitamin B6 also enhances cognitive functions and mental performance and its proper intake facilitates the synthesis of new proteins in the body, aiding recovery. Vitamin B12 participates in the production of red blood cells and neurotransmitters. What is more, it is necessary for proper methylation which is responsible for metabolism of homocysteine. High homocysteine levels have a negative impact on cardiovascular health. Vitamin B12 intake beneficially influences brain function and helps maintain a good mood. To sum up, Olimp Endugen is a combination of two patented formulas which contribute to increasing the body’s performance. The supplement effectively prevents lactic acid build-up in the muscles during a long training session and boosts nitric oxide production. In addition, it will substantially increase energy levels and delay the onset of fatigue. Since it contains B vitamins, it will also stimulate energy metabolism. Depending on training level and individual needs take 2-4 capsules 30 minutes before physical effort. The preparation is addressed to physically active people, performing endurance sports, professional sports and also in the periods of increased, frequent physical exercise. The supplement contains caffeine and its supplementation in late evening hours may entail sleeplessness. Bulking agent - microcrystalline cellulose, anti-caking agents - silicon dioxide, magnesium salts of fatty acids, capsule (capsule components - gelatin, color E171).